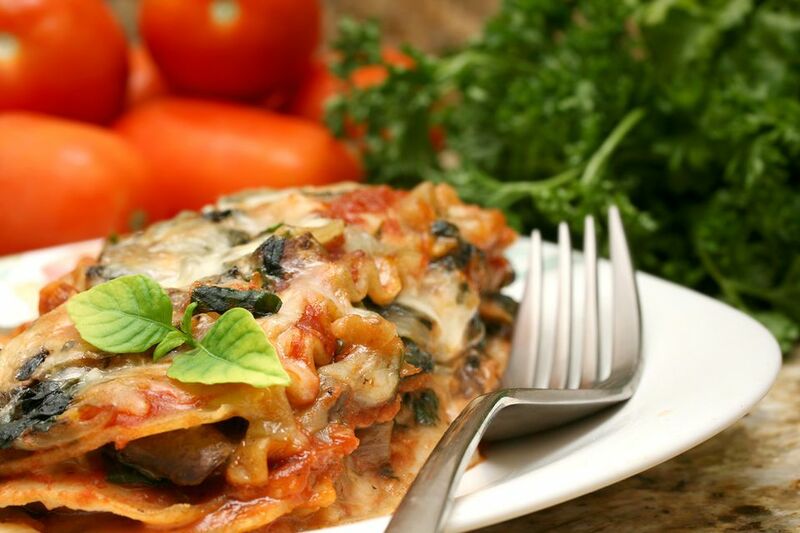 This hearty lasagna recipe is a great way to get picky eaters to eat their vegetables. Each layer contains a new surprise. There's chopped broccoli and spinach in one layer, thinly sliced zucchini in a second, and sautéed mushrooms in the third. The classic inclusion of creamy ricotta cheese and gooey mozzarella makes this lasagna recipe one that you'll make again and again. In a saucier or saucepan, heat 1 tablespoon extra virgin olive oil over medium heat. Add onions and saute, occasionally stirring with a wooden spoon, until onions are soft and translucent about 5 minutes. Add garlic and cook, continually stirring, for 30 seconds. Add tomatoes, tomato paste, and Italian herbs and bring to a simmer, stirring occasionally. Continue to simmer over medium-low heat while you prepare the rest of the lasagna ingredients — season to taste with salt and pepper. Preheat the oven to 350˚F. In a medium skillet, heat olive oil. Add mushrooms and saute over medium heat, occasionally stirring, until mushrooms are softened and brown, about 7 to 9 minutes. Set aside. In a bowl, combine ricotta cheese, eggs, parmesan cheese, 1/2 teaspoon salt and a generous pinch of black pepper. Set aside. In a separate bowl, combine the spinach and broccoli. In a glass or ceramic baking dish measuring approximately 9x13 inches, spread a generous ladleful of tomato sauce along with the bottom with a spatula. Place a single layer of lasagna noodles on the sauce (you'll probably need four, and they can overlap slightly to fit the pan). Spread about one-third of the ricotta mixture on the noodles, and then evenly spread the spinach-broccoli mixture over the ricotta. Sprinkle with about one-third of the shredded mozzarella cheese. Add another layer of noodles, then another third of the ricotta mixture, and evenly layer the zucchini slices over the ricotta. Top evenly with a thin layer of sauce and a sprinkling of mozzarella cheese. For the final layer, add one more row of lasagna noodles, the remaining ricotta cheese, the mushrooms, the remaining tomato sauce, and the remaining mozzarella cheese. Bake in a 350˚F oven for 45 to 50 minutes, until cheese is melting and bubbling. Remove from oven and let stand for 15 minutes before cutting and serving. For the final layer, add one more row of lasagna noodles, the remaining ricotta cheese, the mushrooms, the remaining tomato sauce, and the remaining mozzarella cheese. Bake in a 350˚F oven for 45 to 50 minutes, until cheese is melting and bubbling. Remove from oven and let stand for 15 minutes before cutting and serving.